Even the best-kept decks accumulate dirt, twigs, leaves, and other debris that blows by and weather also takes its toll. To keep your deck in the best condition, you need to give it a yearly scrubbing and then apply a penetrating sealer. I admit that this is a chore that I tend to put off. But there is no reason to procrastinate, grab your bucket and brush on the first nice weekend and let’s get that deck in shape. Which deck cleaner is best depends on the shape of your deck. If you have a lot of algae and mildew, then choose a cleaner with plenty of bleach. If your problem is more dirt, grease, and grime, one of the milder cleaners will work well. 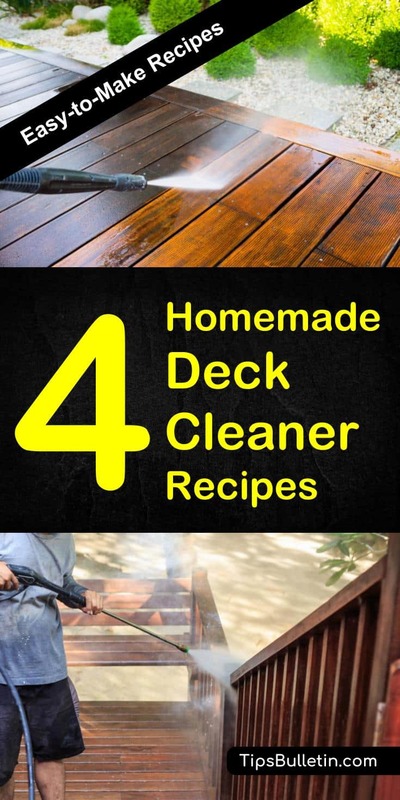 I give you four different formulas here, including a homemade deck cleaner for a power washer. Take a few minutes to read about how to clean a deck and the information on pressure washers, if you will be using one. Once you are sure you understand the process, you should have no problem cleaning your deck each spring. To keep your deck looking good, you need to keep it clean. A regular sweeping is enough for most of the year, but you should give it a deep clean and reseal it at least once a year. As with our tips on how to clean patio furniture, the first step in cleaning the deck is to sweep away all of this debris. Make sure you get everything out of the cracks between the boards also. Rotting debris in the cracks will spread rot to the entire deck. Use a putty knife to get the debris stuck in the crevices. Next comes the real work. Cover your nearby plants with a plastic sheet to keep the cleaning solution from damaging them. Then start scrubbing, using soapy water or one of our deck cleaner recipes. If you have a pressure washer, use it instead of the scrub brush. Power wash or brush the patio cleaner solution onto the deck surface and allow it time to soak into the wood. Give it a good scrub and rinse it away. Check the deck for signs of algae, mildew, and other stains. Go over these with a solution of 1 part bleach to 4 parts water. Let the bleach solution sit on the stain for 15 minutes, then scrub and rinse. If the stain remains, repeat the soak and scrub. Once your deck is clean, give it time to dry completely, then apply a sealer to keep it looking good for another year. If you own a pressure washer, this is a good time to use it. If not, you may want to rent one. For larger decks, you’ll save a lot of time and energy using a pressure washer, but for small decks, a scrub brush will do fine. To use the pressure washer to clean your deck, read and follow the manufacturer’s instructions to avoid damaging your deck or the equipment. Use the fan tip and spray at an angle, leaving 2 or more feet between the nozzle and the deck. Holding the nozzle too close can gouge a hole in your deck. Much depends on the power of your equipment so read the instructions carefully. This first homemade deck cleaner is easy to make, and it gets the job done. It kills mold, dirt, algae, and mildew all at once, allowing you to skip a step in the cleaning process. To use this cleaner, hose the deck down with water to soak the wood, then apply the Mildew and Algae Cleaner. Scrub with a long-handled brush or broom and give it 10 to 15 minutes to soak in. Once all of the stains are gone, rinse it away with clean water. This solution is also a good homemade composite deck cleaner. While not as good as Trisodium Phosphate, dish soap makes an effective cleaner for your deck, and the extra bleach helps get rid of mildew and algae. 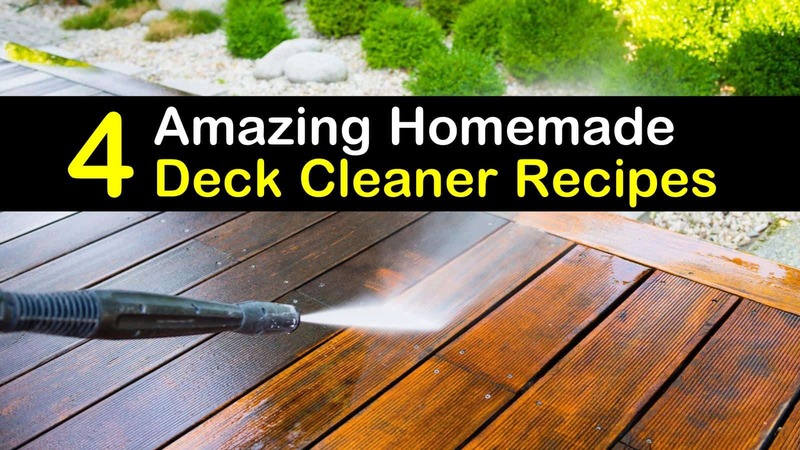 This is the best homemade wood deck cleaner to use if your deck suffers from oily stains, dirt, and grime. Protect your nearby plants when using this solution and rinse it off when done. For a more natural but less effective deck cleaning solution, mix one cup of white vinegar with one gallon of warm water. This all-natural mixture is perfect for delicate teak wood decks where you want to avoid any damage to nearby ground cover plants or perennials. As with all of these recipes, the bleach kills algae and mildew. The rubbing alcohol and soap help lift it away for good. Scrub this cleaner in, let it soak, and rinse it away. This deck cleaner relies on powdered oxygen bleach laundry cleaner (such as Oxi-Clean) to kill algae and mildew. In addition, it prevents the building of wasp nests and keeps yellow jackets away. It is milder than liquid bleaches and needs to be used soon after it is made. Use this solution for decks that are in good condition without major stains and for cleaning between yearly scrubbings. Mix the powdered bleach and water until it is completely dissolved, then add the dish soap and stir gently. It is my preferred homemade deck cleaner for a pressure washer. If you have cleaned your deck as I recommended, and you still have mildew stains, try applying a solution of half and half bleach and water and scrubbing it in. This solution is very strong, so do not breathe the fumes. Let the bleach stand for 15 minutes before washing it away. Do not use full strength bleach or commercial bleach. Also, realize that you do need to scrub the cleaner into the deck. Unfortunately, elbow grease is required, unless you have a pressure washer. >> Further Tip: In case you need a more delicate wooden floor cleaner, make sure you check our DIY wood floor cleaner recipes tips. I hope that this article helped you find the right deck cleaning solution for you and gave you the information you need to keep your deck in shape. This article is about cleaning the deck, but I do advise you to apply a sealer when you have it clean. Let me know what worked best for you in the comments, and please share this article with your friends and family. By spreading the knowledge, we lighten our loads.